I want to apologize to everyone, my laptop, which I create all my art on has taken a dive on me, so I’m using a backup desktop I have. I’m not sure if this is affecting the quality of today’s post, but please bear with me until I can get my lappy up to snuff again. Joe! I had no idea you were in a band! For all of about two months in my freshman year of college. i have an uncanny knack for figuring out what instrument boys play. also, bass is my favorite. no lie. True story: did not notice the OMG CRASH, till it was pointed out. I like stuff like that. well played. hah! it’s cool, we’ll “bear” with you better than that pizzly does with grunge! If most parties ended in someone being tossed out of a window, I would go to more of them. Don’t go in there Liz you will get mauled!! it aint a party without a pizzy throwin people outa windows is it? Your work on these three comics are amazing, I have to say. I don’t see how you have the time to balance them with the pure amount of awesome you put into your art. WTF this comic is so random what the hell is it even about? i am bored and confused. And I am very sorry, I’ll try to get better at story progression. Dont worry. i shouldn’t get annoyed with developing comics. i like the art actually. just make sure all the baddies get a good taste of JUSTICE!!!! thats what i look for in comics. and stories of any kind really. i dont know anyone who enjoys watching a bad guy win (well if they win and then get beaten afterwards its ok. like hair flick guy in the cafe). 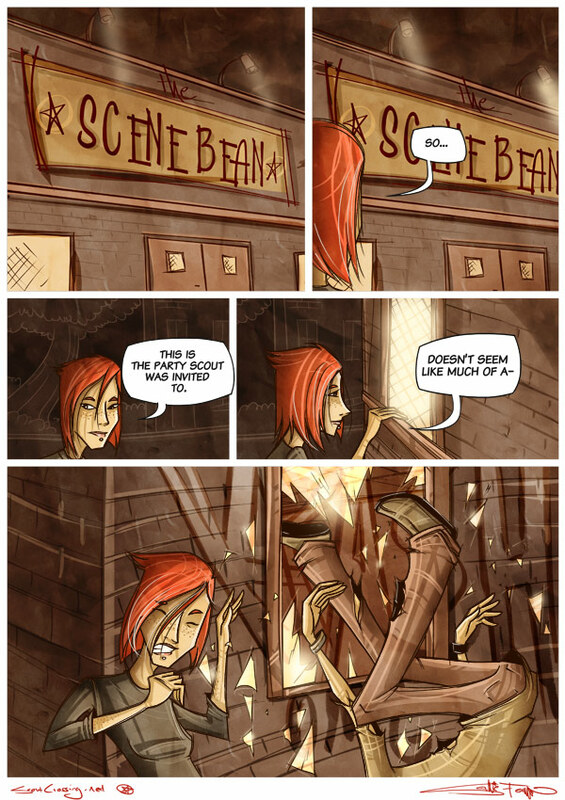 at first i thought this comic was just a cheap knock off of qc (prickly barista with dyed hair, red headed female side kick, hipster jokes) but its obviously shaping up to be something unique and if i do say so myself awesome. keep up the good work! yeah i know… thats what i said did you not read my comment? You seem to enjoy the defenestration of your main characters. I didn’t think anyone knew that word, I heard once and had no idea what it meant haha. You are very right, having someone smash through a window can have reflections, and good lighting elements! Hahahaha, it is a great word, especially because it is a word that means “Throw something out a window” it really doesn’t get more hilarious. Ahh, ok. poor poor scenster, it pays to make sure you are avoiding Bears who have been enraged by early nineties grunge. He won’t make that mistake again, I’m sure he has learned his lesson.